I purchased this mask as part of my Pretty and Cute haul from waaaaay back in September! I realized I had these masks sitting on my nightstand, so this week is going to be all about masks! 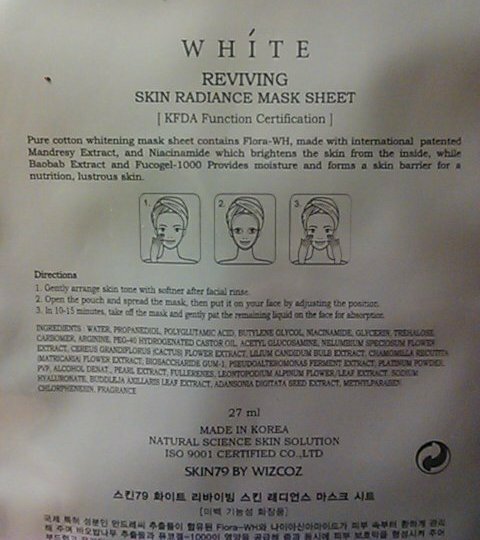 Tonight I'm trying out Skin79 White Reviving Skin Radiance Mask. 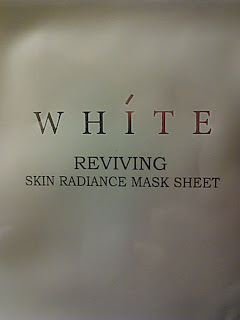 I am very interested in whitening/evening out my skin tone, so I have been looking forward to trying out this mask. 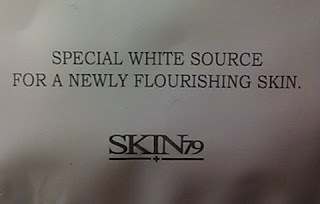 First thing, I wish Skin79 would obtain a better English translator for their packages. The word confusion is cute to me, because it reminds me of my Japanese friends from my college days, who used to practice their conversation skills with me. It was adorable! Plus, I admired their dedication to learning another language. I only speak one language, so I think it's pretty snotty when other single-language people mock non-native English speakers. Hey, they're trying! Ok, off my soapbox. But seriously, I think Skin79 is going to "turn off" American consumers with the imperfect translations; striking them as a product that is somehow less likely to work than some other potion, merely because the translation isn't polished and professional. "Directions: 1. Gently arrange skin tone with softner after facial rinse." I'm guessing that means to apply some moisturizer after washing my face, so that is what I did. I'm not sure what they mean my arranging my skin tone, though. Alright, so let's get on with it! Right out of the package... ooohhhh, it's SLIMY! Ugh! I really don't want to put this on my face! I talked myself into it, though. I mean, lots of stuff I put on my face is a weird consistency (primer, anyone?) until I get it on there and smoothed out. Ok, so on it goes. Again, these masks are not made for larger, non-Asian faces. I have way too much extra mask around the jaw, and not enough over the nose and upper lip, and the eye holes are very small. This is consistent with the other Skin79 masks I have used. This mask is SO wet that I really recommend tearing the eye holes to make them bigger before putting it on your face. I had to work very quickly to keep the liquid from getting into my eyes because I didn't enlarge the eye holes first. This issue, of the mask not quite fitting perfectly, is one that I feel is almost unavoidable. They could make masks in small, medium, and large, but there would still be people out there that it still wouldn't quite fit perfectly. And just because it's funny, here I am wearing it! Ok, there is more of a point to it than that, you can see how it fits... or doesn't, depending on what part of my face it is on. I'm typing this review as I wear the mask. Because this is a single-use product, there isn't a trial time. 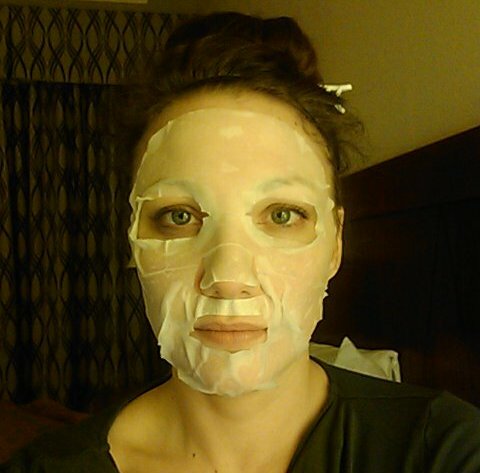 Personally, I like the feeling of pampering more than anything else associated with using a mask. 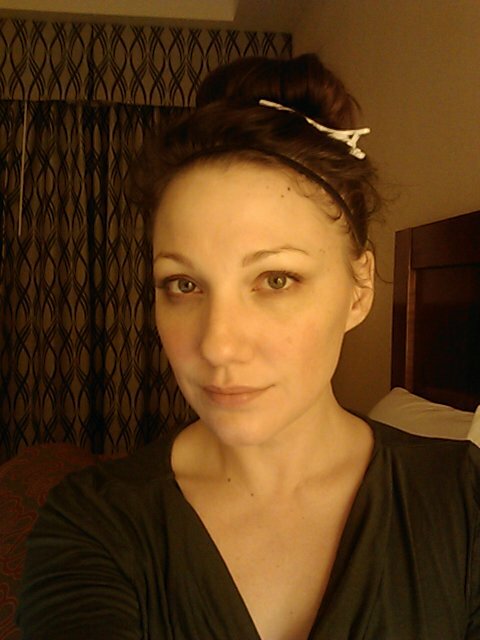 As long as my skin feels soft and looks better for a little while after I remove it, then I'm pretty happy. What I am liking the most about these types of masks is that I don't have to do anything else after I take it off, other than pat my face dry with my fingers. Mud masks and peel-off masks, gel masks and chemical peels; they all require a washing and moisturizing step. These masks don't, so it feels like less work and more fun stuff. The mask does have a scent, and it smells to me of a light fruit (like sliced peaches), a subtle floral (perhaps Baby's Breath), and... cucumber water? It's pleasant, and not overwhelming, but it is difficult for me to identify all the scents, and I think part of that is because there are chemicals in it, and some sort of unidentified fragrance is used, which could be artificial (I'm not good at identifying artificial scents). I'm just going to call it, you can't see any difference in the photo. In person there was a difference, but I'll talk about that in a minute. Immediately after removing the mask, I gently rubbed the remaining lotion-gel-liquid stuff into my skin. This allowed me to get it to places the mask didn't reach. I really love the way my skin feels once it dries; it is very soft and smooth. So, do I think the mask works? Well, my face was less red after using it. However, I did just sit there with a cold cloth on my skin for about 15 minutes, so of course my skin is going to look less red. I don't think this is a treatment that you can use one time and see amazing results. I think that, like most cosmetic treatments, you would have to use it consistently, and over a long period of time, to both see results and then maintain those results. I will say that every time I use one of these masks, I end up thinking to myself "why don't I do this more often? "; so I definitely plan on purchasing more masks when I run out of my little stash. have you tried anything else in the range like the cream or essence? ive been wanting to try the whole line! 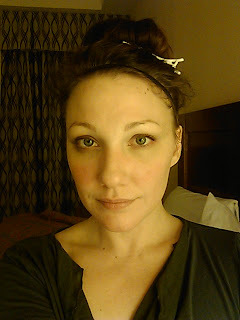 The only other Skin79 products I have tried are the BB Creams. If you try them, and review them on your blog, I'd love to read about them! Thank you for stopping by!